Sakshi Choudhary is the coordinator of X-Stage, the cultural committee of XIMB and a member of XSteC, the Xpressions Steering Committee. She is one of the main organizers of Xpressions'15, the management-cultural fest of XIMB. In this interview, she opens up about what goes behind organizing such a big event and the challenges faced. Q. What is Xpressions to you? A. Xpressions is one fest we have all been waiting for since we joined college, because all the committees have the major events during Xpressions only, and that's when they get most of the exposure that they need and the participation that we want from the good B-Schools and colleges all over India. That's Xpressions for us. Q. Tell us a little about yourself and your role in Xpressions. A. I was a shadow of three committees in the first year when I joined XIMB. I was in XSeed, XStage and Alcom. In the second year I chose to be a part of just X-Stage because that was one committee that I identified with the most, because I like organizing events and I was really excited for all the 5 events that we would organize as X-Stage for Xpressions. That is why I chose X-Stage. My role in Xpressions is mainly handling the event, since I'm the X-Stage secretary of X-SteC also and I am the coordinator of the cultural committee. So my role is basically overseeing all the 5 events that we have majorly, that is the War of the Bands (Decibelz), the dance competition (Thirkan), the singing competition (Goonj), Nukkad Naatak (Aaghaz) and the fashion show (Carnival de Vogue). So these are the five events that come under my purview and thats what we do. Apart from that we do a lot of sponsorship work, we generate funds, we make our shadows go to different companies and we ourselves go to different companies for sponsorships. Apart from that we get judges, organize the whole thing, the decor of the campus. From A-Z, everything related to Xpressions comes under the 9 of us who are in X-SteC. Q. How do you think Xpressions can be used as a medium to inspire people? A. Since last year we have been planning two more events in addition to the three major events of Xpressions which happens in November. So as a precursor we organized X-Pallavan and X-Athon, both of which were social inititiatives. X-Pallavan was a plantation drive basically and we went around distributing saplings to people in popular places of Bhubaneswar. That's how we inspired the youth to care about the environment. The other thing was X-Athon which is a mini marathon, that invited people to take care of their health. 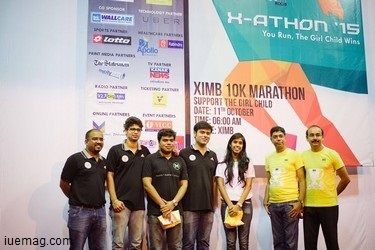 The cause of X-Athon was the "Girl Child", so it served a dual purpose as it was healthy and it encouraged people to help the girl child and help her grow. SO that was one good thing about Xpressions. Also, the winner of X-Athon was a very young boy from a little less privileged family. So that was one thing that inspired all the students, to do something big in life. We do not need a lot of resources (to succeed). So that's what is inspirational. Q. Is there any idea behind Xpressions that you find inspirational? A. 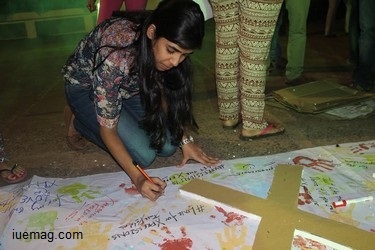 Every year students are encouraged to come out with newer ideas, how to make Xpressions better,not only in terms of footfalls and entertainment aspect, but also in what way we can make a difference to the society. This year the new thing that we did was Swach Bharat. Though we did not do it on a very large scale, we went around to schools and local areas, which we found in a really bad condition near our college and we went around cleaning them, speaking to a lot of people who live around the area and telling them the role they should play in keeping their surroundings clean. So that's how every year we try and implement one small idea. Q. What re your dreams for Xpressions this year? A. Any organizers dream would be that everything goes well. We are really hoping that it does not rain and we are hoping that we can manage the crowd well because we have had incidents where the crowd is not manageable. We have put many plans in place. We have planned an X-Cops team, which is a bunch of students who will be taking care of the security. We also have a hospitality team. So whatever comes to our mind we try to take care of all that. But at the last minute you never know what could go wrong. So we are just hoping that nothing goes wrong. Fingers crossed! Q. What is your favourite part about being in Xpressions and organizing Xpressions? A. My favourite part is definitely being close to the celebrities, going to pick them up from the airport and getting clicked with them! This year we have Ranvijay and Vishal-Shekhar and we are really excited to get clicked with them and spend time with them. You have a lot of perks if you are in the organizing team, you don’t need to get any passes. You have all the resources at your disposal. So that is one good thing. Q. What is the most challenging thing about organizing Xpressions? A. Mainly the money factor is very challenging. We have been planning this event since June when we went for our internships. We have been forming teams and deciding on which celebrity we want to book because their dates go away. So we have to book celebrities 3-4 months in advance. Back then we did not even have a penny in our account. We had to take that plunge and have faith in ourselves that we will be able to pull it off and that we will be able to get that amount. Now since we have almost reached our target, it gives us a sense of accomplishment that that we have been able to pull it off. But yes, the money factor is very risky because many times the sponsors will agree to pay after the event and we bank on them and take loans from the administration of the college on that basis, but then they end up not paying. It is risky, but it is also fun to have such an experience. Q. What would be your message to the youth? A. I'd say whenever you come to a college, be it undergrads or post grads, don’t get too involved in studies. That is definitely important, but once you socialize and get involved in other things you get a lot of practical experience. In fact just organizing an event you learn about time management, money management and how to deal with different kinds of people. People will get angry at you, there will be people who will be sweet to you, there will be a lot of gossip so you have to deal with all of that. Once you go into the work field you have to face all of this so why not now? Any facts, figures or references stated here are made by the author & don't reflect the endorsement of iU at all times unless otherwise drafted by official staff at iU. This article was first published here on 15th November 2015. Interning IJ Ayesha Cassim is a contributing writer at Inspiration Unlimited eMagazine.